The Ulster Classic Motorcycle Club held it's inaugural grasstrack event as part of the Ulster Grand Prix week last Friday evening at Dundrod. The event was run in aid of the Air Ambulance NI and donations for the charity were collected on the night by two very lovely ladies! There was a very healthy entry for all three classes at the event and plenty of action for the spectators who attended to appreciate. Special guest rider was Irish and Ulster Short Circuit Superbike Champion Charles Stuart riding a borrowed West German Maico machine courtesy of Conlig's Tony McKee. Stuart took to machine like a duck to water and plainly enjoyed himself over the three leg Grade A Trophy races. His main rival for the honours was Ballymena's Trevor Calderwood riding a Honda on the night to great effect and purpose and in the end just short of pipping Stuart for the overall having to settle for a very creditable runner up spot with the Ballycastle man posting two wins and a third place to Calderwood's two second place finishes and a win in race two, with Stuart edging it by virtue of his last race victory. Pushing them hard all night was Yamaha mounted Donaghadee man Jonny Lusk who rode consistently to bag a brace of thirds and a fourth place spot to claim third overall on the night. In the Grade B event it was a young Comber rider Thomas Murdock riding a Yamaha who made the running, posting no less than two start to finish wins and sandwiching a second place result in race two claiming the overall result. Kells rider Norman Worthington(Maico) was the fly in the 100 per cent ointment of Murdock as victor of the second battle and riding strongly added two runner up berths to secure second overall. Lisburn's Richard Portis (EMC Sachs) finished third overall on the night with consistent third,fourth and fifth places on one of the few quarter litre bikes in the race. In the Grade C event it was the turn of a recently returned to racing Mark Harrison(CZ) from Carryduff to dominate proceedings bagging three start to finish wins and claiming the first place trophy from youngster Matthew Millar (CCM) and veteran Carrick rider Desi McCrea(Bultaco). 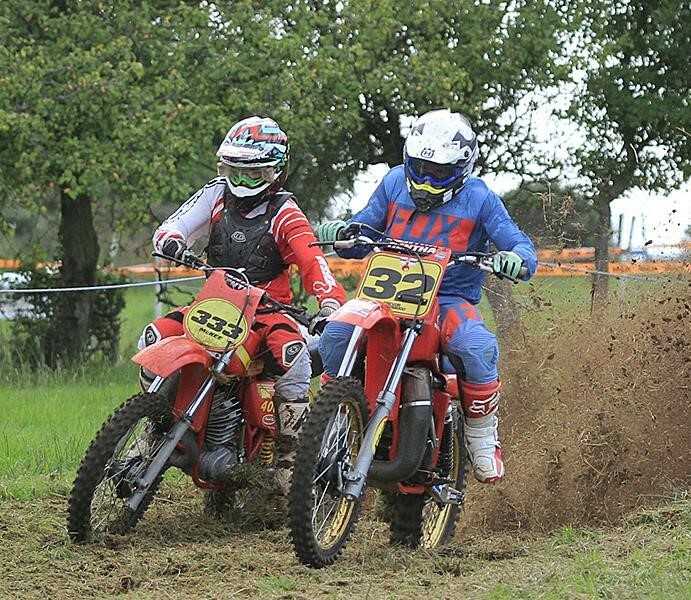 Landowners brother Niall Bell(Husqvarna) had the great misfortune of running out of petrol while in second spot in the first race which despite his subsequent brace of runner up positions in race two and three, knocked him out of contention for a trophy.